In January 2004, EA reminded us that arcadey pick-up-and-playable football still has a place in the hearts and libraries of console gamers everywhere when they dropped NFL Street. Eleven short months later and here we are for NFL Street 2 and arcade ball still works for us on Xbox, PS2 and GameCube. For a fun quick fix game NFL Street 2 is still surprisingly sophisticated when it comes to the control scheme and depth of gameplay and that's the hook of the whole "Street" franchise it seems. There's plenty of quick payoff, but there are many levels to master to that an expert player on the sticks will looking nothing like a rookie who picks it up and has a blast the first time. 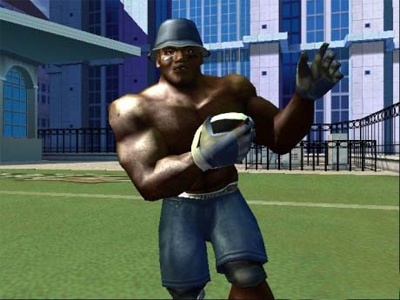 The biggest thing missing from NFL Street 2 is more. More personality, more wackiness and more outrageous elements that would really drive home the fun-arcadey message. The first game was a nice effort and a fine surprise for those of us who can't get enough football, but we all knew that it was just the tip of the iceberg. We all knew that there was potential for a lot of cool stuff coming out of that game engine that Tiburon created. There are definitely a lot of enhancements and improvements in NFL Street 2, we just want the evolution to be a little faster. With two NFL Street games in the same calendar year, it seems we're getting all that that short time frame allows. There are all sorts of game types built around the basic premise of pickup football, including mini-games, two-extended career modes and quick play modes with tons of tweakable options to keep things interesting. But the hallmark of the EA Sports Big lineup is plenty of trickery using press and hold button combinations to control the fun. Street 2 maintains this but adds to this with an all new system of wall moves. The walls were a part of gameplay in the original, now you'll be using them for specific advantages and bonuses throughout NFL Street 2. In a nutshell, you can run up walls during a play to avoid tacklers when you have the ball; you can run up a wall to launch a pass or run up a wall to make a reception and you can make these plays off of posters or "hotspots" on the walls for added bonuses. The offensive move ratings for your players now include how well they can use walls to their advantage as well as how effective their juking, spinning and stiff arming can be. Using the walls effectively is something you'll eventually master in Street 2 once you've got plenty of games under your belt and it really opens up a whole extra layer of action for veterans of the first game. It's an example of how a seemingly simple arcade football game can offer more depth than you'd expect and keep delivering new experiences. Running up a wall to fling a long bomb on a play action pass is cool because you have to avoid the rush to get to the wall, time your wall run appropriately with the right button combo and the height advantage is obvious once you're up there. Same goes for using a wall to get your receiver up there to make the snag. And all of this is on top of the pre-existing system from the last game of laterals, trick plays and showboating moves from the original game. You get all of that back and then some with the new wall move mechanics. Much like the original game, The Sims, The Sims: Bustin' Out lets you create one sim or an entire family of sims and move them into a house you build and design. Bustin' Out features improved higher-r..